Website design office property management rental companies | Website design for Norfolk based property management covering all of Hampton Roads. 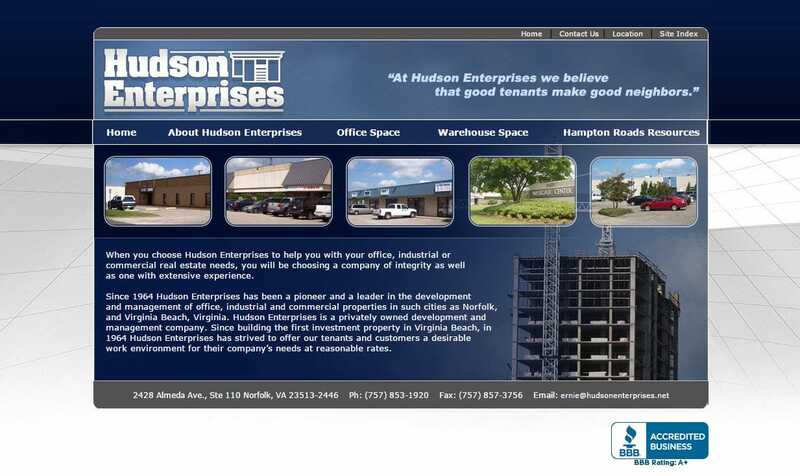 The website features access to photos and floor plans for all Hudson properties. The website also features a .NET database for fast posting and viewing of lease properties from within the website or by accessing PDF files. When searching Web site design, develop Norfolk Virginia look no further than the web database specialist at VISIONEFX. VISIONEFX, a Web design company based in Virginia provides services to national companies as well as small to medium businesses throughout the United States to include; custom web design, web development, E-commerce web design and product database programming, Word Press web design, Word Press Plugin customization, Joomla web development, SEO – search engine optimization and website maintenance and support with an enthusiastic sense of urgency. Call VISONEFX at (757) 619-6456 or email direct to info@visionefx.net.